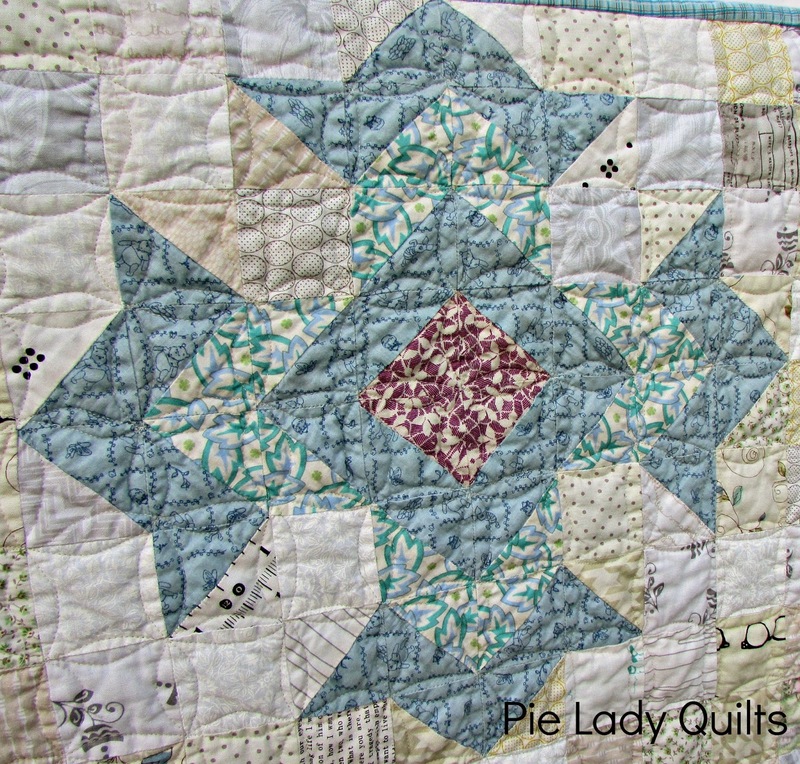 This post has been a long time coming as I have been in the trenches with a quilt. You know exactly what I am talking about, right? Gritted teeth, steely eyes, it’s-gonna-be-you-or-me contest of wills. Well, it wasn’t just that I felt like progress ground to a halt a time or two. Matters were not helped by listening to the entire Hunger Games trilogy WHILE doing a ten day juice fast and trying to sew as fast as I could. Do you have any idea how much Suzanne Collins goes on and on about food? I may or may not have shouted, “For the love of Peeta, stop talking about bread!...and that lamb stew!...and…and…freshly roasted game! YOU ARE KILLING ME!” and then I’d sew some more. 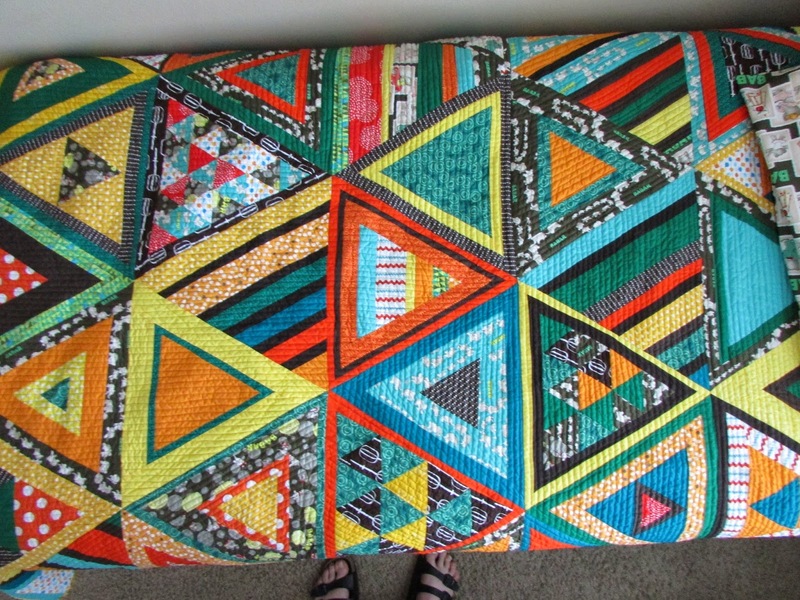 The result is a quilt that I look at and see equal parts beauty and achievement. Strangely, I also seem to want a snack. 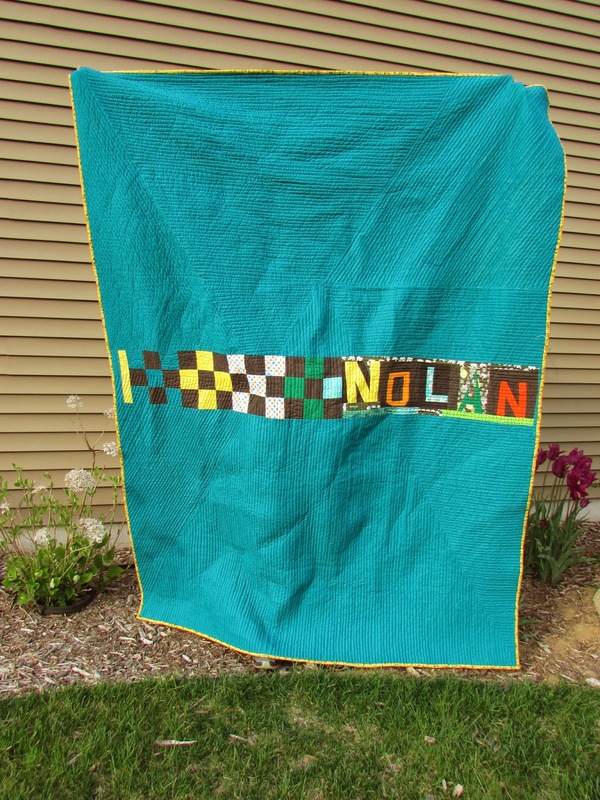 This quilt is a commissioned piece meant to celebrate a high school graduation. In the conversations leading up to the design, I learned that Miss E, the graduate, had a special affinity for Winnie the Pooh and the color blue. Her mother liked classic block structures like rail fence. So, in short order this quilt became all about the finding the perfect fabric and the perfect block. After much searching I finally checked out Etsy. I found a seller (here) that had out of print Winnie the Pooh panels that were just fantastic; expensive, but perfect. 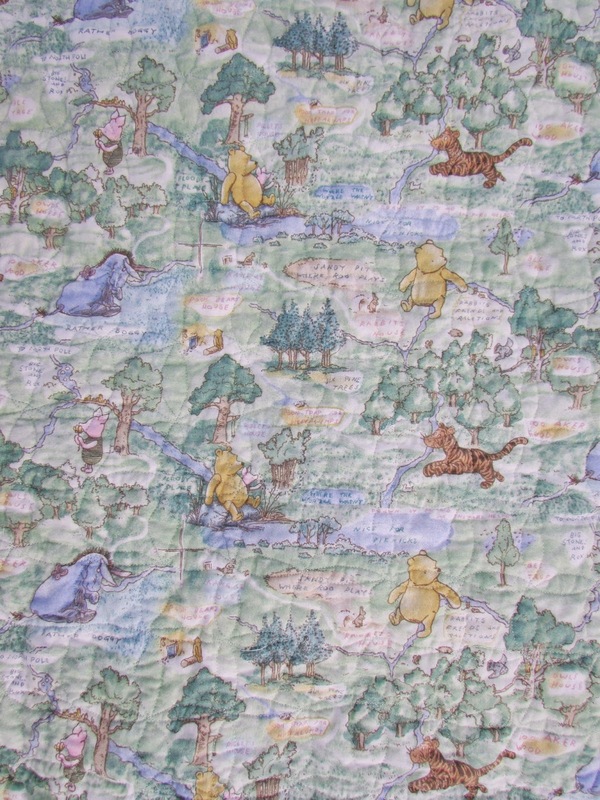 The fabric looked just like a copy of the illustrations from a vintage Winnie the Pooh book. I also found a warm honey tonal print with bees and a pale blue tonal with outlines of Winnie. I really love the quilter’s reference books with black and white illustrations of classic block patterns. Those books are a great starting point for blocks and quilt ideas. 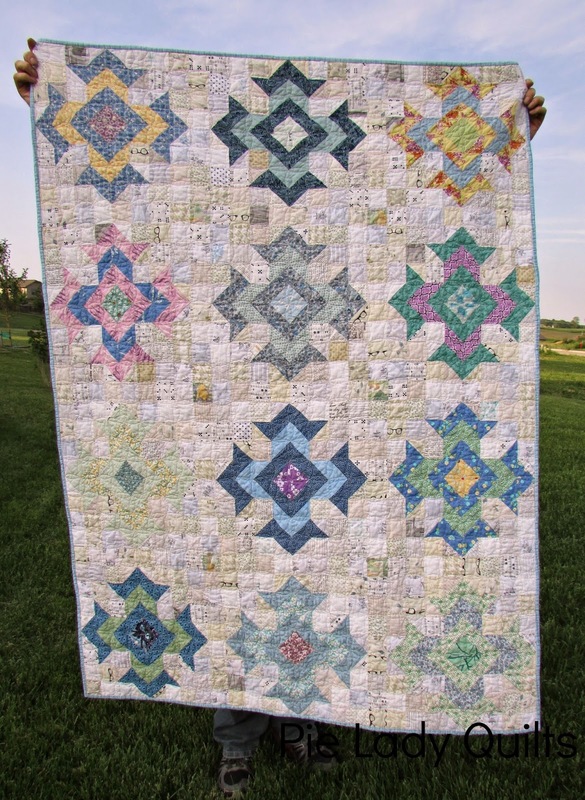 The particular book I used for this quilt was 1000 Great Quilt Blocks by Maggi McCormick Gordon. I snapped a few pictures of what I felt were good candidates to go with the vintage-style print. Miss E’s mother chose the block called God’s Eye. I decided to make the background pieces all 2.5” with an assortment of low-volume prints. I love the look it gives. The geeky glasses print from Riley Blake is my favorite part and is the bridge from vintage to modern. 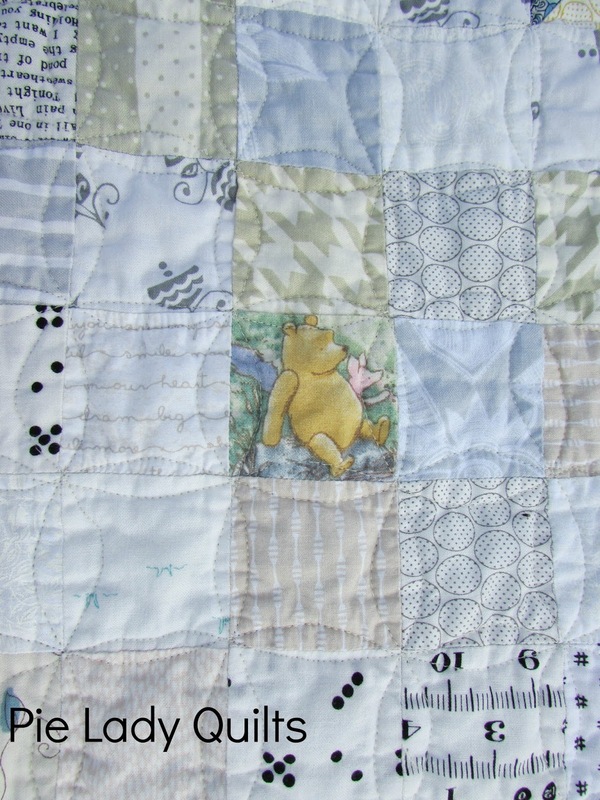 I also made a few fussy cuts from the Winnie the Pooh illustration panel and placed six of them throughout the quilt. Winnie is chilling with his friend Piglet in an ocean of cream, white and gray. Miss E’s mom shared with me the quote that inspired the whole Winnie themed quilt. We decided to make the quote a permanent feature of the quilt, so I did some improv piecing and included it in the back of the quilt ala The Babar Triangle. Really, I think my future as a ransom note writer is assured. Ha! Every graduate deserves a bit of advice, so I thought I’d offer up an important formula necessary for college success. Ready? Winnie the Pooh + God’s Eye + a message from your mother = a dorm room with LOTS AND LOTS OF STUDYING! I am mostly kidding. Mostly. 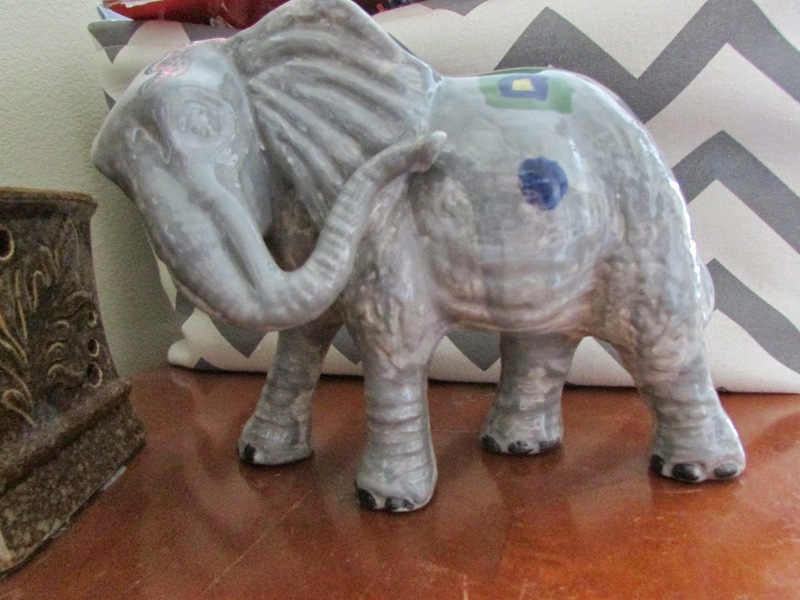 Other than chicken burritos, there is not much that my son loves more than elephants. A few weeks ago, we celebrated his older brother's birthday at a ceramics place. I told the kids that they could pick out anything they wanted...no restrictions. Nolan passed up Iron Man, Spider Man and even his dearly beloved Incredible Hulk to pick up this elephant. He painted him the obligatory gray, but then went for more colors of paint. When he got back to the table, he asked me to turn him into Elmer (The Patchwork Elephant). I did as much as I could whilst supervising 5 kindergarteners, 1 preschooler and 1 baby who was missing her nap in a room full of breakable objects. That is how much he loves elephants. So, without further ado, let me introduce "The Babar Triangle," the birthday bedspread for my little boy that has watched every, and I do mean EVERY episode of "Babar" and has checked out EVERY Babar book in our library (a couple of times). I really stepped out of my comfort zone with the colors for this quilt. This was not a combination that came naturally for me, and truthfully, I fought it. I ended up telling myself that I was picking colors out for Nolan, and that this palette was every facet of his four year old personality. Warm sun, green grass and sweet thoughts. The reflection time was good for me, though. I vowed to use a heavy hand with brown, which is I think the only thing that kept Babar from having a vacation in the tropics. 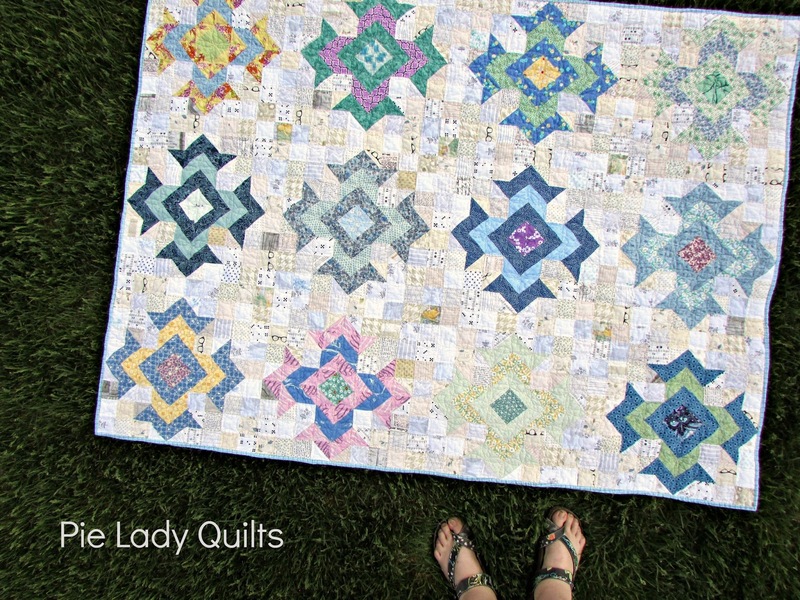 The one indispensable item I used in making this quilt was a template. I made my own out of a sheet of acrylic and an acrylic knife using a pattern I drew up. I constructed my own equilateral triangle pattern with a protractor and newsprint to make a triangle that was 15 inches tall. The best part of having a template was having the flexibility of going hog wild with triangles, and knowing you could cut everything down perfectly to the exact same size. I paper pieced about half of these blocks. I know, I know. 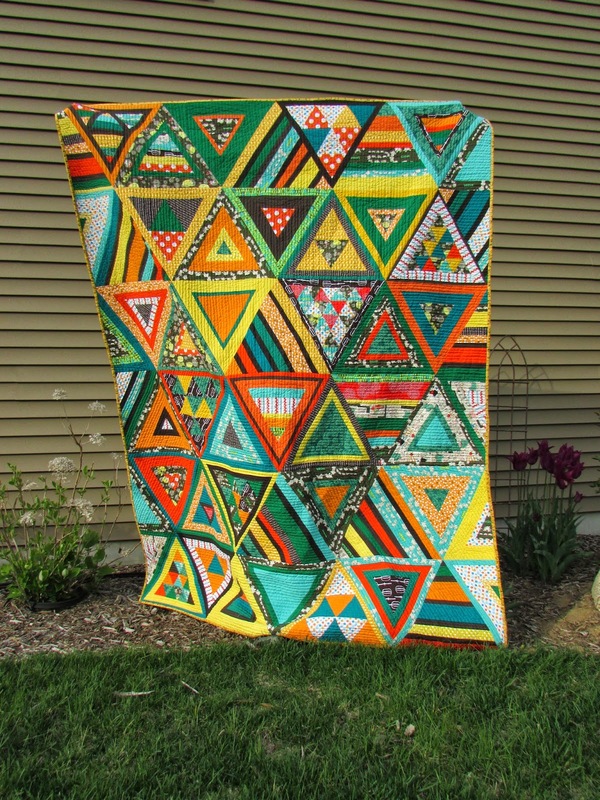 But, a 15 inch triangle is BIG and I didn't want a quilt full of friendly triangles waving back at me. I slapped down that template on top of a newspaper and got an instant paper foundation. After that it was simple to draw in piecing lines. My six year old son helped me draw them in one lazy afternoon. 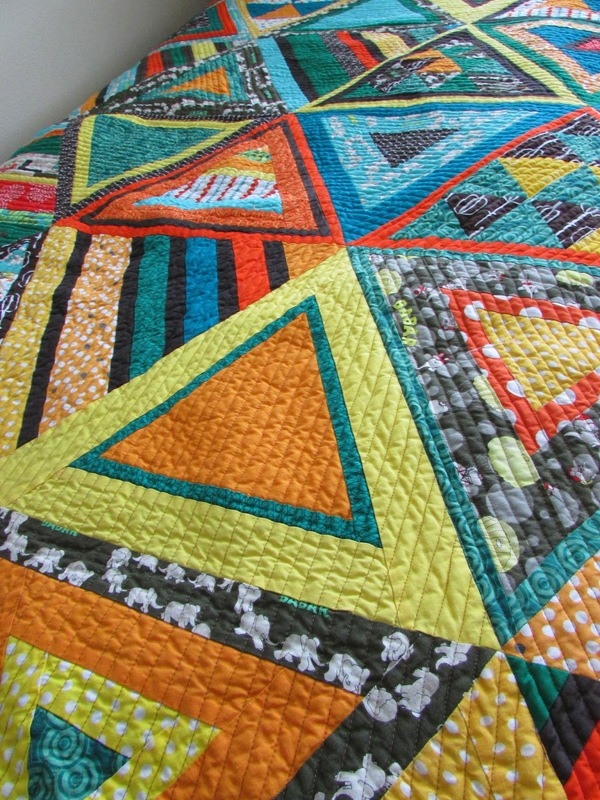 The rest of the quilt blocks were a combination of intentional design and serendipitous scrap management. :-) I am still thinking of things I could do to a triangle. Ha! I started having second thoughts about writing his name in the back. Once I finished the letters, I asked my husband what he thought of them. 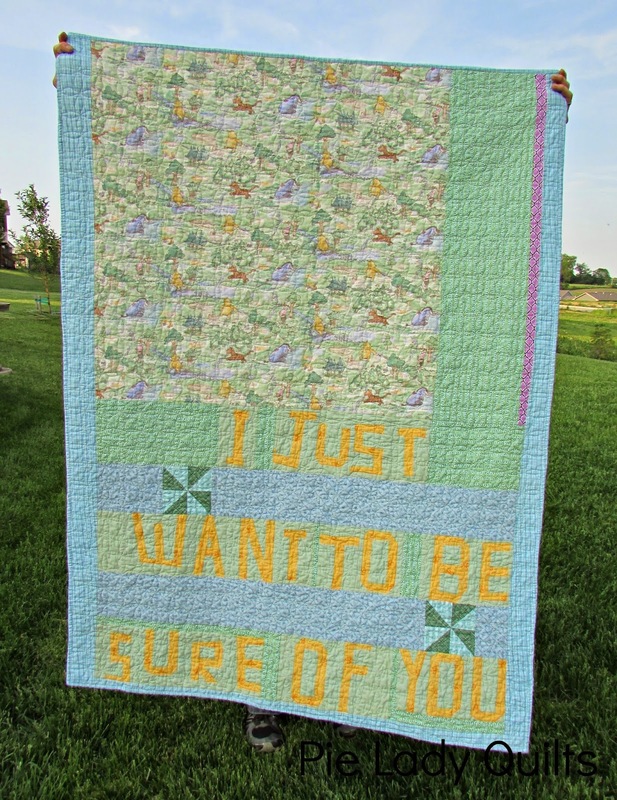 He told me that if the whole quilt thing didn't work out I could always take up ransom notes. Yep, that's exactly what I was thinking. Seriously. The other thing I was thinking is that this back deserves a name. I would call it "Hubris, by Jill Fisher." One of my favorite episodes from "The French Chef" was when Julia Child tried to teach how to make a grated potato pancake. I say "tried" because when she tried to flip it using the pan, she dropped most of it on the stove. "Whoops," she said. "I just didn't have the courage of my convictions!" So, despite my reservations about doing a pivoting design on a not-so-forgiving solid background, I tried it anyway. I just checked the back in a borderline compulsive manner during the entire process. 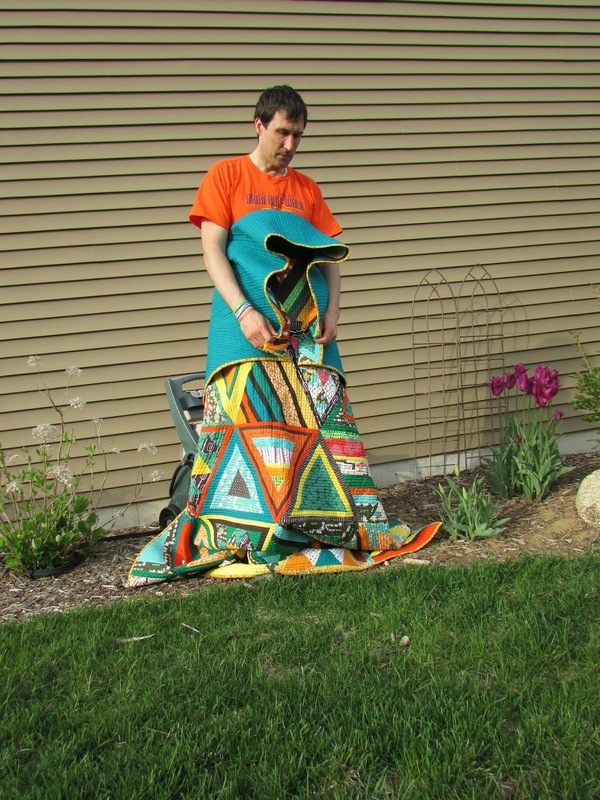 It's hard to hold up a twin size quilt. It was hard doing pivoting straight line quilting on a twin size quilt. If we keep doing this, we're both going to have AWESOME shoulders. 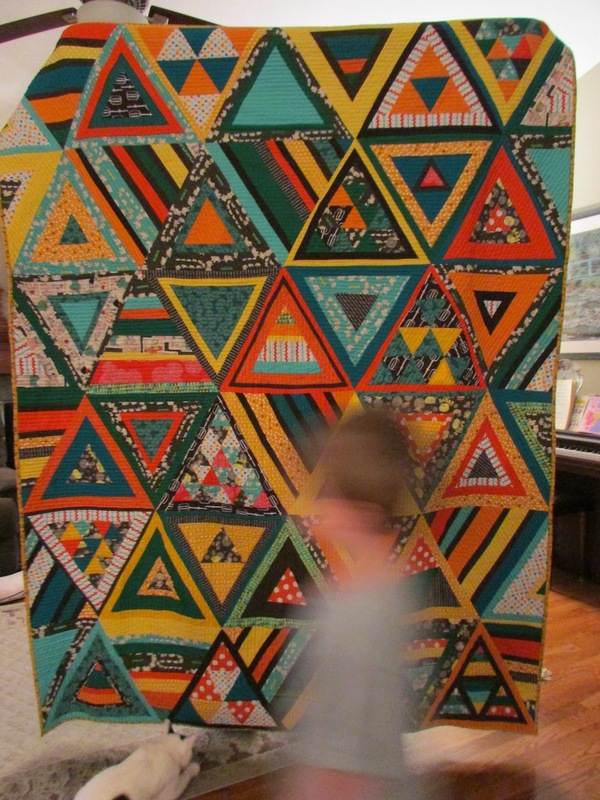 Here is Nolan, photobombing his own quilt. He is asleep under it as we speak and he went to bed with a huge smile on his face. I am happy too.